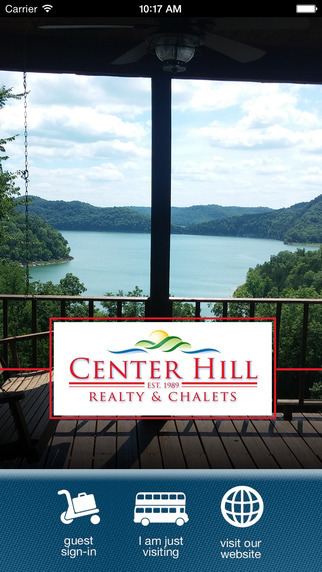 The Center Hill App is designed for rental guests vacationing at properties managed by and visitors interested in finding out about what the Center Hill Lake Area has to offer while on vacation. Center Hill Chalets manages over 35 rental properties in and around the Center Hill Lake area Download our App to unlock the secrets for having a great time on your next vacation.Guests of Center Hill Chalets will receive an invitation to download the App before their arrival. This App contains all the information each guest needs to know before, during, and after his or her stay. From arrival tips, directions to the property, property tips, and area information, to restaurant, event, and activity recommendations – this App has everything you need to spend more of your vacation having fun! If you get lost, don’t worry. The App allows you to locate your rental property using your phone’s GPS. Likewise, all of the restaurant, event, and activity recommendations may be viewed on a map to locate the closest to you at any time. Center Hill Chalets has combed through all of the area restaurants, events, and activities, and hand selected only the best to recommend to you. Now, you can vacation like a local!You don’t have to be a guest of Center Hill Chalets to get this customized experience. Simply download the App and use it as a visitor. You still have access to all the area restaurant, event, and activity recommendations. While you are here, check out all of the great rental properties that Center Hill Chalets has to offer. This App contains all the property information you need to book your next vacation in paradise. Each property listing contains detailed information and photos. In case you want to check out the properties before booking, the App allows you to view the properties and all the amenities they have to offer.This App is powered by Glad To Have You.